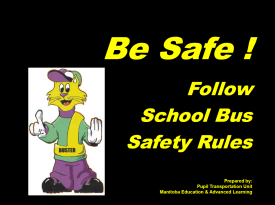 The Manitoba Curriculum Support Centre (previously known as the Manitoba Education and Training Library) houses a variety of school bus safety resources. Once in the Support Centre site, click on “Go to Catalogue” in the top right corner; on the next screen, type “school bus safety” in the search area at the top of the page. 2019 Red Lights Mean STOP! 2020 Can’t Touch This - The Danger Zone! Over the years, PTU has produced materials that reflect school bus safety themes. Materials have been geared primarily to two main audiences - students and parents/the motoring public. The links below provide access to this information. To download the PowerPoint Presentation to your computer right-click and select Save Target As... from the pop-up menu. Select the folder where you would like to place the file. Contact PTU in Winnipeg for more information. An additional supplier of school bus safety resources is Mission Nutrition, a Minneapolis-based company that stocks school bus safety resources. In the 1990's, the United States' National Highway Traffic Safety Administration (NHTSA) developed a School Bus Pedestrian Safety Training Program consisting of guides and videos to assist grades K-6 teachers teach school bus pedestrian safety. In 1994, Manitoba Education and Training used this model to develop its own program - A Teacher Resource for School Bus Ridership Education - Grades K-4. The program consists of the teacher resource manual and various support materials and videos. To obtain further information on this program, Contact PTU.